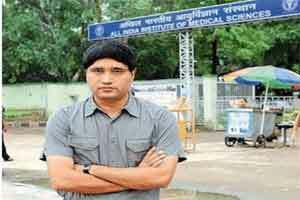 New Delhi: The Centre alleged in Delhi High Court that an NGO was being “used as a proxy litigant” by IFoS officer Sanjiv Chaturvedi to raise the agenda of alleged corruption in All India Institute of Medical Sciences (AIIMS). The Ministry of Health and Family Welfare alleged in the court that the Centre for Public Interest Litigation (CPIL) has brought the allegations which were levelled in personal capacity by Chaturvedi, who was the Chief Vigilance Officer of AIIMS from 2012 to 2014. A bench of Acting Chief Justice Gita Mittal and Justice C Hari Shankar was told by Additional Solicitor General Sanjay Jain that the PIL was filed at the behest of Chaturvedi who should be made the petitioner by discharging the CPIL from the matter in which a CBI probe has been sought. “Why CPIL, a reputed NGO which raises important issues, is being used as a proxy litigant here by lending its name to Sanjiv Chaturvedi who should actually be the petitioner. CPIL should be discharged from the case and instead Chaturvedi should be made the petitioner,” the ASG said. He said that Chaturvedi, the 2002 batch Indian Forest Service (IFoS) officer of the Haryana cadre, is a private respondent who has filed several affidavits in the matter and CPIL is a reputed petitioner whose name should not be spoilt. “Chaturvedi’s personal dispute should not be brought in a PIL,” the ASG submitted. The bench listed the matter for further proceedings on October 12. Initially, a PIL was filed by the NGO seeking CBI inquiry in various cases of alleged irregularities and corruption in the AIIMS raised by Chaturvedi during his tenure between 2012 and 2014. The court had earlier issued notices on the petition seeking revival of all cases in which actions were initiated by Chaturvedi before he was sacked by the union health minister Harsh Vardhan in August 2014 as chief vigilance officer of AIIMS. The plea has contended that Chaturvedi, who is currently posted as Conservator of Forest at Haldwani in Nainital District of Uttarakhand, started initiating action in corruption cases related to various malpractices including “supply of dubious medicines by a private chemist shop, having influential political nexus, role of middlemen in making fake out-patient department (OPD) cards”. The PIL, filed by advocate Prashant Bhushan, has claimed that despite there being prima facie findings of corruption by CBI and the then CVO against some of senior functionaries of AIIMS, no step was being taken to register a case. The NGO had also alleged that an attempt was being made to close the cases through collusive departmental enquiry. However, CBI, in its latest affidavit, has said “it is submitted that CBI in its findings have found no criminality on the part of officials or officers of AIIMS and hence no FIR was registered”. The CBI’s stand was similar to that of the Ministry of Health and Family Welfare which, in its reply to the NGO’s application, had said the allegations made against some of senior officials “could not be established”.